Ivanka Trump has weighed in on the Brett Kavanaugh sexual assault allegations in her familiar (and routinely ineffective) way, according to a report from Vanity Fair. 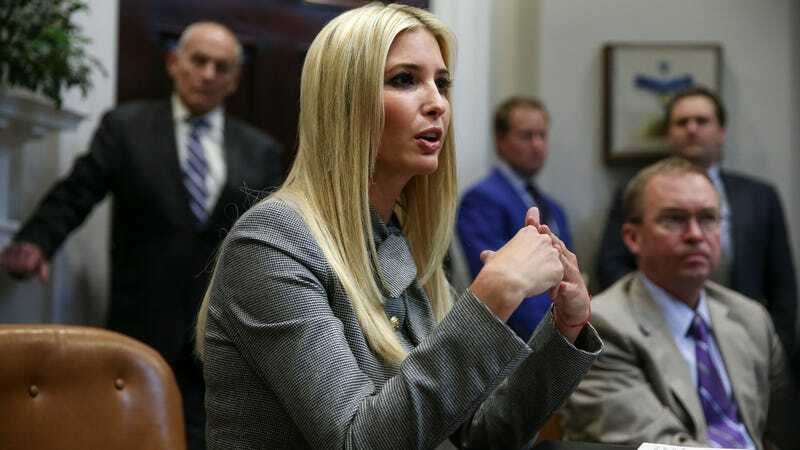 A source said that, behind the scenes, Ivanka suggested her father “cut bait” and drop Kavanaugh as Supreme Court nominee. Whether she came to this conclusion out of empathy for Christine Blasey Ford—the California professor who says Kavanaugh sexually assaulted her when they were teens in the early 1980s—or pure political expediency (or a wishy washy combination of the two) is unclear. Her public silence, however, is about what you would expect. The Vanity Fair piece also depicts an unsettled White House (when isn’t it? ), where there are fears that Ford’s account will be corroborated by women who say Ford told them about the alleged assault around the time that it occurred. As all this is happening, Trump hasn’t been the attack dog we’d normally expect when one of his nominees is in peril: He’s shown predictable sympathy for Kavanaugh—on Monday, Trump told the press that Kavanaugh is “one of the finest people”—but he has also said that he supports a hearing process. That hearing, however, is shaping up to be a sham orchestrated by Republicans to discredit Ford and push through Kavanaugh’s nomination. No wonder Trump supports it.